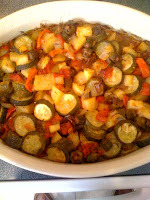 Ratatouille is a popular recipe from the French region of Provence, consisting of eggplant, tomatoes, onions, bell peppers, zucchini, garlic, herbs, simmered in olive oil. It can be served hot, cold, or at room temperature, and the vegetable combination can vary according to the season, and to the cook's preference. Does this recipe sound familiar? It should! It's been a popular dish for Armenians, Greeks, and the like for many a moon. An any-time-of year, but especially good during Lent (when made without meat) recipe, is Turluh,or Tourlou Gouvedge, a "mixed-up" vegetable stew. This was sent in by Ara Kassabian to add to our ever-growing Lenten recipe collection. Thanks again, my friend! “This can be made vegetarian or non. Its success depends on the freshness of the vegetables, so splurge on farmer-market produce or wait until the summer, but for heaven's sake do not use three day old wilted veggies. The list of vegetables can be adjusted based on what's fresh and available in the market. I am not giving exact quantities because the quantities depend on the size of your baking dish (see below).